Built to feel like it'll last forever. Capability to a higher power. Half a mile of thread. 45,000 stitches. And one unblinking eye. Even with its perpetually fresh design, ergonomic layout and advanced luxuries, the G-Class cabin remains a living tribute to a tradition of handcraftsmanship that's all but vanished from the earth. And for decades, a single inspector has allowed no G-Class to undergo your scrutiny until it first surpasses his. Paintwork and personalization: Matched by eye, unmatched by anything. 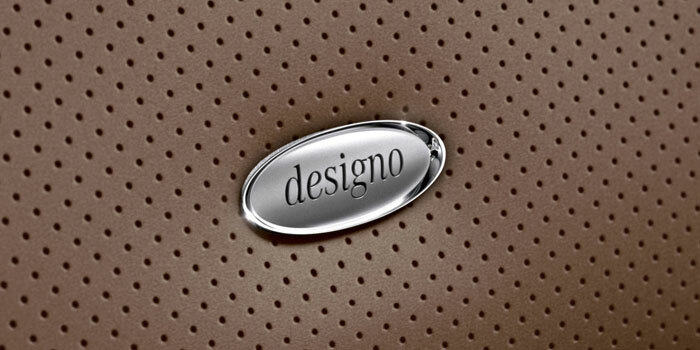 Exquisitely handcrafted cabin appointments offer an almost unlimited palette of personalization: Literally dozens of Nappa leathers, in a variety of styles, colors and stitching details. Six hand-finished cabin trims in rich wood or carbon fiber. And a rich spectrum of paintwork, from classic solids to modern matte finishes. ESP, 4-ETS, ABS, Brake Assist and Trailer Stability Assist do not operate when the differential locks are engaged. Off-road driving should only be attempted by drivers with the necessary skill, experience and understanding of the vehicle's limits. Locked differentials will limit steering ability. Read Operator's Manual before driving off-road or in deep water. 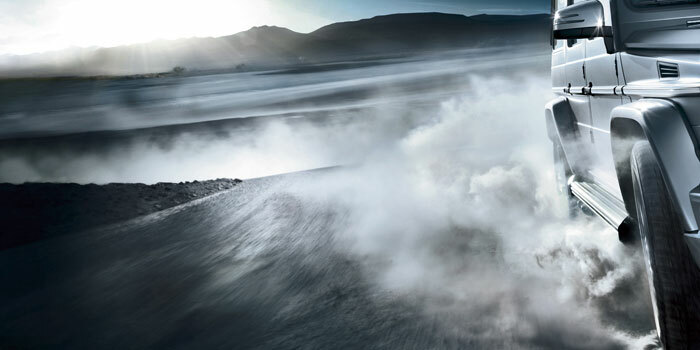 An advanced V8 biturbo engine generates 416 hp and 450 lb-ft of torque from a compact 4.0 liters of displacement. Able to thrust the G550 from 0 to 60 mph in just 5.8 seconds, it features a "hot inside V" turbo layout, patented low-friction NANOSLIDE® cylinder walls, and an ECO Start/Stop system. 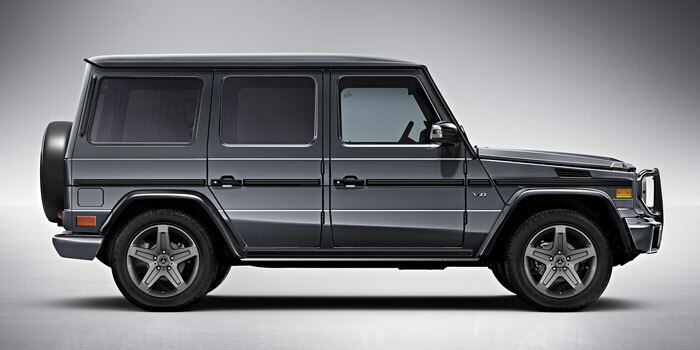 The standard G-Class permament all-wheel drive system continually sends power to all four wheels. Its 4-wheel Electronic Traction System (4-ETS®) instantly apportions torque to the wheels that can use it best, for surefooted grip on snowy and wet roads. Off-road, its locking differentials help you conquer muddy, loose or uneven terrain. It'll take you to extremes. And back again. Timeless, meet fearless. 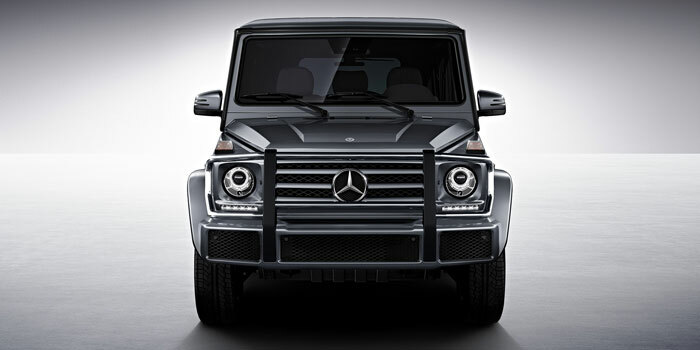 With nerves of hand-welded steel, the new G550 4x4-squared raises every measure of G-Class capability. Gear-driven portal axles and 22-inch wheels create over 17 inches of ground clearance. Dual spring-struts and 10 inches of added track conquer extreme terrain, yet they let you enjoy its lavish cabin on any road. 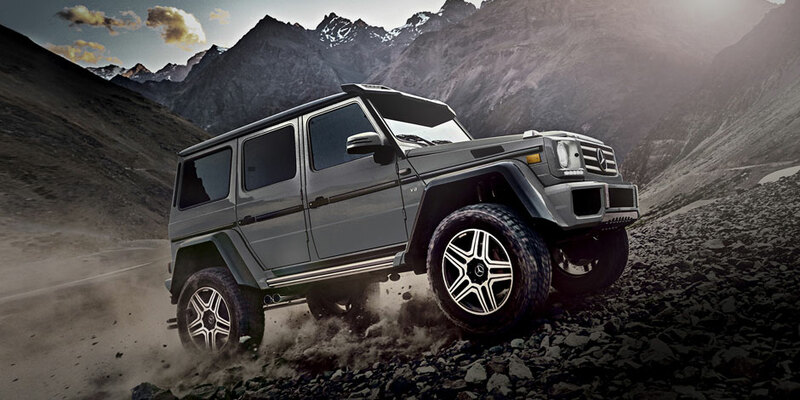 There are only two handcrafted SUVs with handcrafted power, and they both start with G: the 563-hp V8 AMG G63 and 621-hp V12 AMG G65, the most powerful SUV in production. 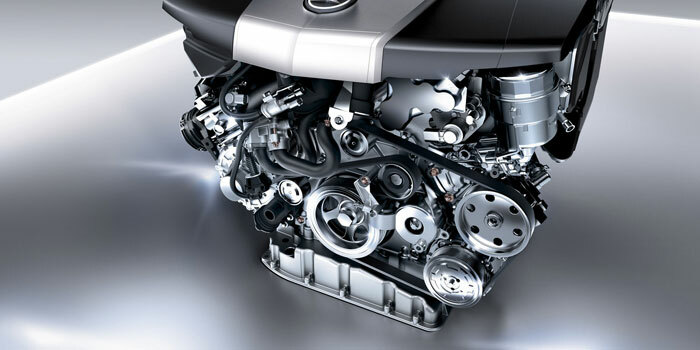 A single master craftsman hand-builds each biturbo engine. 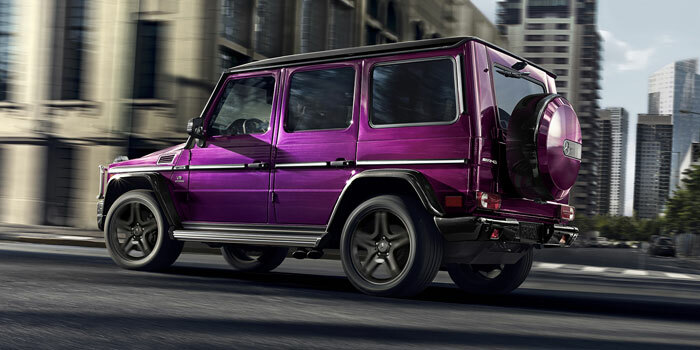 It's teamed with an AMG SPEEDSHIFT® PLUS 7-speed and 20- or 21-inch AMG® wheels, and wrapped in exquisite luxury. Technological teamwork helps make driving safer and easier. 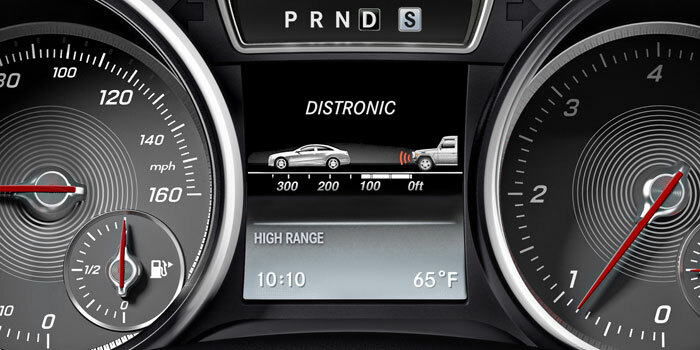 Distance Pilot DISTRONIC cruise control uses radar to adapt your speed to the traffic flow, even stop-and-go. Blind Spot Assist, a rearview camera and Parking Assist PARKTRONIC help you sense your surroundings, for added safety when changing lanes or maneuvering in tight quarters. 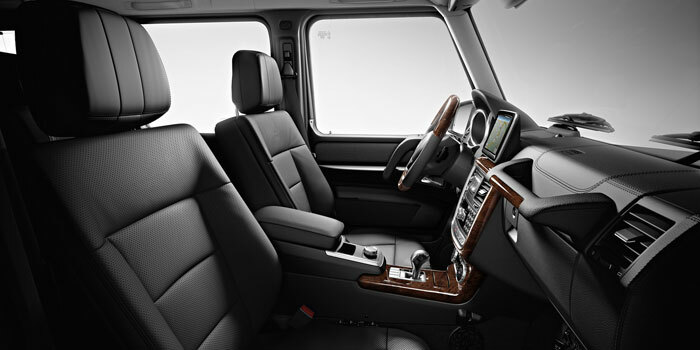 Distance Pilot DISTRONIC, Blind Spot Assist and Parking Assist PARKTRONIC are not available on G550 4x4-squared. DISTRONIC adaptive cruise control is no substitute for active driving involvement. It does not adapt cruising speed in response to stationary objects, nor does it predict the curvature and lane layout of the road ahead or the movement of vehicles ahead. It is the driver's responsibility at all times to be attentive to traffic and road conditions, and to provide the steering, braking and other driving inputs necessary to retain control of the vehicle. Drivers are cautioned not to wait for the system's alerts before braking, as that may not afford sufficient time and distance to brake safely. Braking effectiveness also depends on proper brake maintenance, and tire and road conditions. See Operator's Manual for systems' operating speeds and additional information and warnings. From your car, computer or phone, mbrace connects you to your world. Enjoy in-vehicle apps like Yelp® and local search. Let remote diagnostic tests help keep your car healthy. And use remote features to turn on the lights, lock the doors, and more, all from the Mercedes me app.Get mbrace® Connect standard for five years with any new model. All Mercedes-Benz mbrace® services operate only where cellular and Global Positioning System satellite signals are available, which are provided by third parties and not within the control of Mercedes-Benz USA, LLC. Five years of the mbrace Connect package are included with new-vehicle sales and leases at an authorized Mercedes-Benz dealer. Subscriber Agreement is required for service to be active. Some services are only available on select vehicles. Your PIN is required in order to use certain services. Some services may be limited or restricted in some areas. Driver is responsible for complying with traffic and other laws. See your dealer or MBUSA.com/mbrace for details. 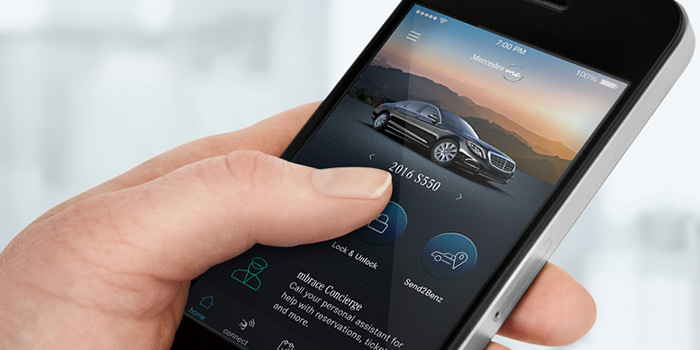 The Mercedes me app is compatible with Apple iPhone® models running iOS 8.0 or later, and Android-based phones running OS 4.3 or later. 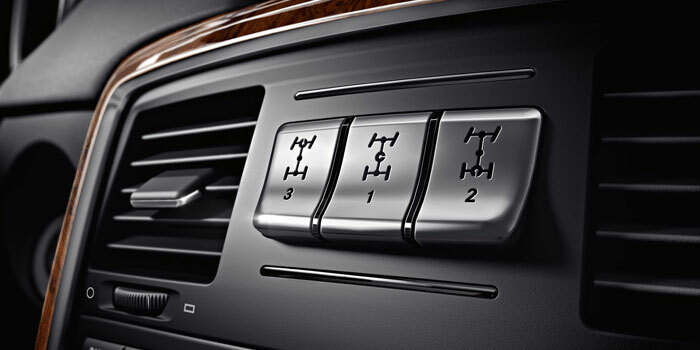 Advanced entertainment, navigation and communication systems work with intuitive ease in the G-Class. Bluetooth® lets you make calls hands-free and play music cable-free. The elegant central controller and color displays put a world of features within easy reach. Available Rear Seat Entertainment brings first-rate video to the second row. The purchase of a new, satellite radio-enabled vehicle includes a 6-month introductory subscription to the Sirius All Access package, and a 5-year introductory subscription to SiriusXM Traffic and SiriusXM Weather. SiriusXM Traffic and Weather services are available for select markets. SiriusXM Satellite Radio, SiriusXM Traffic and SiriusXM Weather subscriptions are sold separately or as a package after trial period. If you decide to continue your subscription after your trial, the plan you choose will automatically renew and you will be charged according to your chosen payment method at then-current rates. Fees and taxes apply. To cancel you must call SiriusXM at 1-866-635-2349. See SiriusXM Customer Agreement for complete terms at siriusxm.com. All fees and programming subject to change.